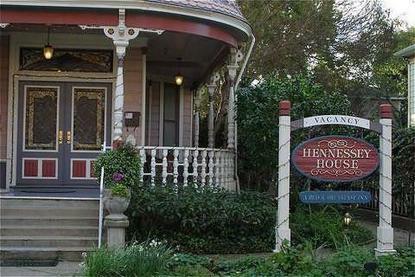 Hennessey House, located on a residential portion of Main Street, is the perfect home base for exploring all that the valley has to offer. You'll be minutes from world-famous vineyards and a stroll to restaurants, shops and theatres. At the inn, gardens bursting with color greet you. Sip wine and share conversation by the fountain, under the garden trellis or on the deck or warm your body and soul in the sauna. Watch the sun rise over the mountains from the front porch. Inside the air-conditioned house original woodwork, Belgium and English antiques and elegant decor remind you of yesterday's craftsmanship and luxury. Relax with romantic fireplaces, two perons whirlpool tubs and feather beds in some rooms. At breakfast, indulge in goodies like blueberry stuffed French toast. Three o'clock is time for tea & cookies, and in the evenings we serve wine & cheese.